ver the years, I’ve made dozens of quilts and nearly half of them have featured one block in particular. It’s called the LOG CABIN and it’s THE QUILT BLOCK that I return to time and time again because of its simplicity and versatility. If you’re new to quilting, I think the Log Cabin quilt block is the perfect block to start out with. The Log Cabin design is built around a small fabric square called the “heart”. Alternating strips are sewn on either side of the heart to build out the overall block. The key to a beautiful Log Cabin quilt block is the selection of LIGHT and DARK fabrics that surround the heart (or center square) of the block. Take a look at my fabric strips below which make up my lights. These fabrics can actually be any shade you like as long as the combination of fabrics on one side of the heart are darker than the combination of fabrics on the other side of the center heart. Take a look at how the caramel colored strips line up in the photo below to make up my darks. 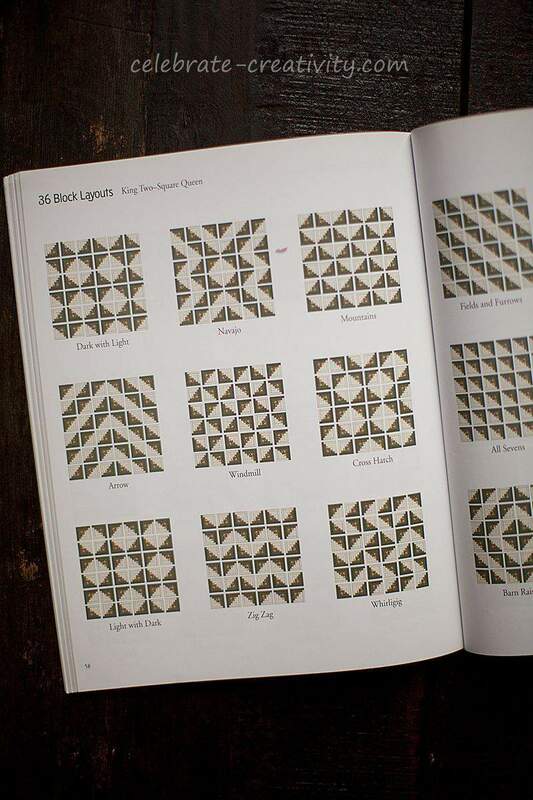 While all the blocks in a Log Cabin quilt are identical, you can create a multitude of designs depending on how the blocks are arranged before being sewn together. Check out a few of the other Log Cabin quilts I’ve made over the years if you click here and here and here. I haven’t decided yet what design I will use for these blocks but there are loads of Log Cabin designs to choose from. As I mentioned, just changing the position of the blocks will produce a completely different pattern. NOTE: The lighting on the next few shots was not optimal so the color of the blocks isn’t as accurate as the above photos. It’s fun to arrange your blocks according to various patterns to create different designs. Here are few examples of how identical blocks can be arranged to create new designs. The above designs represent just a small sampling of the many different patterns that can be created using the Log Cabin block. One of the best Log Cabin instruction books I’ve ever come across is from the Quilt in a Day book series by Eleanor Burns who is widely considered the “queen of quilting”. The book includes easy to follow, step by steps, techniques, tips and illustrations of dozens of Log Cabin designs and you can buy a copy here. Meanwhile, here are a few of the other coordinating fabrics I plan to use with these blocks for borders and for a scalloped binding. NOTE: Many people shy away from a scalloped quilt edge because they think it’s harder. I think it’s actually easier to construct than a straight edge. I’ll share a more detailed explanation of quilt scalloping later in an upcoming post. If you’ve never made a quilt before but always wanted to, check out my previous post entitled, How to Make a Quilt from Start to Finish. You’ll see the quilting process from raw fabric to finished, scalloped quilt. Thanks for the beautiful inspiration. My log cabins are always scrappy. It never occurred to me to use the same fabrics. When the fabric is as gorgeous as what you’ve used, why Not? I need to do some fabric shopping! Thank you for sharing. Yes, the Log Cabin is a wonderful pattern and is my go-to design too. 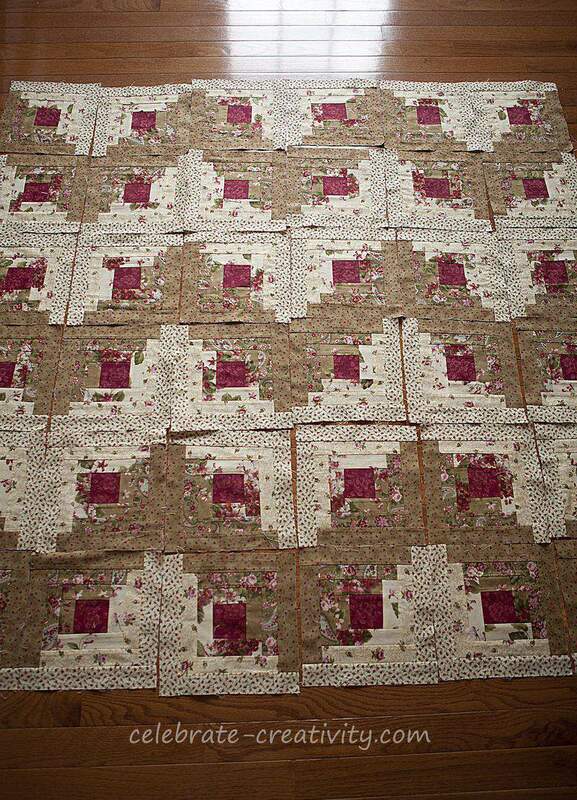 The first real quilt I ever made was a Log Cabin and I haven’t looked back-lol. Good luck with your upcoming projects. I love fabric shopping too. Lisa I love your creativity in design. I love your photography staging and sharing these designs which can be made from a basic light and dark block. Great Job!! Thanks Kathy. I really love the Log Cabin quilt block too. There are so many different designs that can be created and it’s truly one of the easiest blocks to make. Good luck with your quilt project. Wow! I had no idea there were so many designs with the log cabin squares!! Thanks for sharing! Exquisite, exquisite Lisa…the Log Cabin quilt square was the first quilt square I made in quilting class YEARS ago….one of my favorite patterns…. Oh wow! This was an amazing post. I’m new to your blog but feel so inspired after having read this post. I have not made a quilt for a few years due to an international move and having to build up all my tools again, but I am so inspired by this post that I cannot wait to get my rotary cutter and fabric out to attempt a log cabin quilt. Love the fabrics you’ve chosen! I can’t wait to see it finished!!! I love the display of different ways to use Log Cabin but I especially like the fabrics you use. Can you tell us which ones they are, some look like they belong to a collection which I think in this case makes the pattern look so pretty. Your photography is stunning Lisa. Thought you might like to see a quilt that I made. I’ve always wanted to make a quilt but have been intimidated by them. I will have to give it a try. I just love the fabric choices you made the colors are beautiful. Now this all makes sense to me! Thanks Lisa! Your fabrics are so pretty Lisa! In all my quilting years, the only kind of log cabin I’ve made has been a wonky log cabin. I definitely have regular log cabins on my long list of quilts to make though. I’m looking forward to seeing your pretty quilt finished!